Ahmedabad: Club Enerji, Tata Power’s nationwide movement, is changing the way the country is using its energy and natural resources, one city at a time. 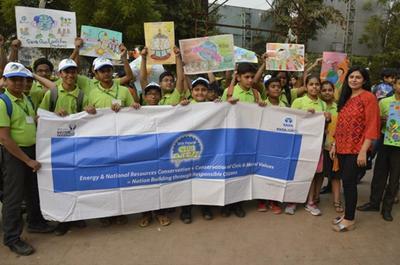 In this attempt, Tata Power’s Club Enerji, organised a mega awareness rally, in Ahmedabad, on the occasion of Children’s Day. Over 100 enthusiastic students along with parents and teachers from St. Kabir School in Naranpura took to the streets to spread awareness among the citizens of Ahmedabad on issues plaguing the city such as spitting, food wastage, and energy conservation. More than 2,000 people were sensitised in the rally. The objective of the rally on Children’s Day was to sensitise a larger audience in Ahmedabad about the need for personal hygiene, community living, and energy conservation. The students and teachers under the able mentorship of Neetu Thakkar, an energy mentor of Tata Power Club Enerji, hosted a street play at Havmor Corner, opposite Vastrapur Lake, attracting a healthy audience. The play was on the importance of maintaining a hygienic and clean surrounding by avoiding spitting, and stopping wastage of food. The skit ended with a song on energy conservation that defines every aspect of daily living. The students followed up the entertaining act with a rally from Havmor Corner to Ahmedabad’s most loved One Mall. The kids also performed their skits at Gulmohar mall. The students also performed three skits at One Mall, on the topics of energy conservation, Clean India, and Go-green India in line with the national agenda of Swachh Bharat Abhiyan. The Club Enerji programme has reached out to over 500 schools in India and has sensitised over 15 million citizens, who in turn have helped save more than 21 MU of electricity till date. The club also has 1,337 self-sustaining mini Club Enerjis and has won several national and international accolades.